As a follow up to our popular Top 10 and Top 5 lists, we recently did an evaluation of the newspapers in terms of the publishing industry coverage and come up with Top 5 best newspapers to read about crime books and authors. We specifically looked at the print and digital content of 50 U.S. and U.K. newspapers, judging them not only by the quality of articles and reviews in their “Books” section, but also their website features such as overall design, aesthetics and general usability of the site. Lastly, we checked if the newspaper had a solid crime section and if they covered the genre regularly. 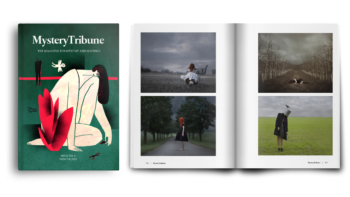 What comes next is our Top 5 picks of the best newspapers in terms of covering new books, author interviews and industry news. 1. New York Times: Not surprisingly, this is our favorite U.S. based newspaper. The articles in the Books section never disappoint the reader and the general feeling of the NY Times site is also pleasing to the eye and easy to navigate. In addition to traditional online and print version, NY Times publishes regular podcasts about the new exciting books and interviews with notable authors. When it comes to crime fiction coverage, NY Times has a star reviewer which is hard to match for rivals: Marilyn Stasio has been the “Crime Columnist” for The New York Times Book Review since about 1988, having written over 650 reviews as of January 2009. She says she reads “a few” crime books a year professionally (about 150) and many more for pleasure. She also writes for Variety, The New York Post, New York magazine and others. She has served as a dramaturg at the Eugene O’Neill Theater Center. 2. Guardian: Our favorite British newspaper has a large section dedicated to Crime Fictions. They usually cover European titles which might not get highly noticed in the U.S. and in a way their site is complementary to NY Times. Having said that, the newspaper has stepped up its coverage of U.S. crime news so this is a great place to check out the book news. 3. LA Times: For the ones who are looking for more coverage of the what is going on in the book world on West Coast. Like NY Times, they also publish a best seller list for fictions and non-fiction books. 4. Washington Post: We love this newspaper’s book section specially on the digital side, mostly because of simplicity and predictability. There are few sections available to the users such as Recent Reviews, Sunday Reviews and Blogs and for most of time, that’s about it! Readers always know what they are getting from Washington Post and are used to the few contributors’ style and tone of writing. 5. Telegraph: Another notable British newspaper with a simple and beautiful design and elegantly written articles.